The Shorthorn breed of cattle originated on the northeastern coast of England in the counties of Northumberland, Durham, York, and Lincoln. As early as 1580 there existed a race of superior short-horned cattle on the Yorkshire estates of the Earls and Dukes of Northumberland. 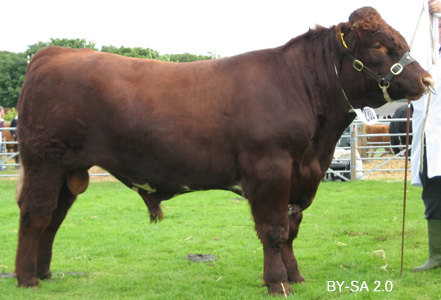 The early breeders of Shorthorn or Teeswater cattle left a heritage with which later breeders could work. The cattle that they developed were usually of considerable size and scale, with wide back and deep, wide forequarters. Their hair and hide were soft and mellow. In their herds, the bulls Foljambe (263), Favorite (252), and Comet (155) were bred and used, and they also used the great bull Hubback. Although color ranges from red to roan to white, roan (a mixture of red and white) and red are the predominant colors. They are a medium size breed with a truly rectangular shape with a short, broad head and wide set eyes. And, you guessed it, they have short horns. Shorthorns are known for their early maturity, adaptability, mothering ability, reproductive performance, hardiness, good disposition, feed conversion, and longevity. In the feedlot, these cattle attain 1,000 to 1,200 pound weights at an early age and have no trouble producing carcasses that grade Choice.